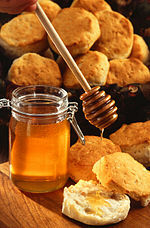 A biscuit is a type of food. They are small baked breads or cakes. British digestive biscuits (which are called cookies in the U.S.). In British English, Australian English, Canadian English and New Zealand English, biscuits are usually sweet and can be eaten with tea, milk or coffee. In North America these are called "cookies". In spite of the difference, this is the meaning in the name of the United States' most famous maker of cookies and crackers, the National Biscuit Company (now called Nabisco). The Simple English Wiktionary has a definition for: biscuit. This page was last changed on 27 February 2018, at 15:17.